Delivering the longest and most detailed address of his pontificate to date—which clocks in at more than 4,000 words—Pope Francis today addressed the bishops of Brazil at the residence of the archbishop of Rio de Janeiro, Archbishop Orani Tempesta. In a speech already being described as the Holy Father’s most significant address as pontiff yet, he discussed his vision of the Church’s mission in the modern world (“Today, we need a Church capable of walking at people’s side, of doing more than simply listening to them…a Church able to make sense of the ‘night’ contained in the flight of so many of our brothers and sisters from Jerusalem”) as well as particular challenges facing the Church in Brazil (“What is needed is a solid human, cultural, effective, spiritual, and doctrinal formation”). Below is the text of the Holy Father’s address, via Vatican Radio. Pope Francis celebrates Holy Mass at Campus Fidei, announces the next city to host World Youth Day and prays the noon Angelus. Pope Francis thanks the many volunteers involved in World Youth Day at the Pavilhão 5 do Rio Centro (Pavilion 5 of the Rio Center). Pope Francis is closing the biggest-ever Roman Catholic World Youth Day event with a Mass on Brazil's Copacabana beach. Up to three million people are estimated to have gathered for the service in the city of Rio de Janeiro. 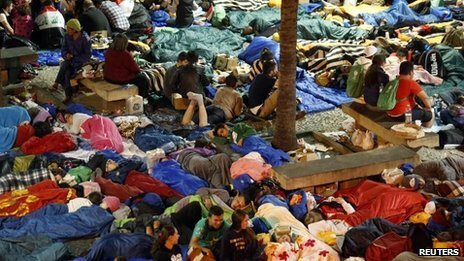 Many of the pilgrims had slept on the beach after attending an all-night vigil, which the Pope also led. Sunday's ceremony marks the end of his first foreign trip since becoming pontiff in March. Pope Francis, who has spent five days in Brazil, is set to fly back to Rome later on Sunday. The BBC's Wyre Davies in Rio says almost every inch of the two-and-a-half mile long beach was occupied ahead of the Mass, as most of the young people stayed after the vigil, pitching tents or sleeping in the open. (Vatican Radio) Jesuit Father Federico Lombardi, director of the Vatican Press Office, told Vatican Radio that Pope Francis has personally requested the presence of a sick child when he presides Sunday’s closing mass for World Youth Day celebrations in Rio de Janeiro, Brazil. The little girl, who suffers from anencephaly, a condition which means she was born without a large part of her brain, will be brought up to the altar during the Offertory procession. Most children affected by anencephaly do not survive this condition or are aborted before the pregnancy comes to term. The little girl’s parents presented her to Pope Francis as he was leaving Rio’s Saint Sebastian Cathedral following Saturday’s mass with religious. The couple said that though they could have legally aborted their sick child, they decided to celebrate her life. (Vatican Radio) Pope Francis on Sunday celebrated the concluding Mass of World Youth Day on the beachfront of Copacabana in Rio de Janeiro in the presence of over 3 million people. “Go and make disciples of all nations”. With these words, Jesus is speaking to each one of us, saying: “It was wonderful to take part in World Youth Day, to live the faith together with young people from the four corners of the earth, but now you must go, now you must pass on this experience to others.” Jesus is calling you to be a disciple with a mission! Today, in the light of the word of God that we have heard, what is the Lord saying to us? Three simple ideas: Go, do not be afraid, and serve. 1. Go. During these days here in Rio, you have been able to enjoy the wonderful experience of meeting Jesus, meeting him together with others, and you have sensed the joy of faith. But the experience of this encounter must not remain locked up in your life or in the small group of your parish, your movement, or your community. That would be like withholding oxygen from a flame that was burning strongly. Faith is a flame that grows stronger the more it is shared and passed on, so that everyone may know, love and confess Jesus Christ, the Lord of life and history (cf. Rom 10:9). Rio de Janeiro (CNN)–Pope Francis closed out World Youth Day with a final Mass before a giant crowd on Copacabana beach of millions. "Go, do not be afraid, and serve," the Pope told the crowd Sunday. Catholic pilgrims from around the world traveled to Brazil for the weeklong celebration and a chance to see the pontiff, whose visit was a shot in the arm for a church that has seen its share of scandal and troubles. Massive crowds followed Francis at every stop on the trip. Organizers and local officials said 1.5 million people came out for the Way of the Cross observance on Friday. The mayor's office in Rio said final estimates for a prayer vigil on Saturday could reach up to 3 million. On Sunday, the Vatican citing civil authorizes put the crowd for the final Mass over 3 million. At the conclusion of the service the pope announced, "We have an appointment for the next World Youth Day in 2016 in Krakow, Poland." Pope John Paul II was the bishop of Krakow. This month, Francis signed off on a second miracle for the long serving and popular pope, allowing the church to declare him a saint. A formal date for the canonization has yet to be announced. The pope concludes his first international trip on Sunday and returns to the Vatican. (Vatican Radio) It’s official: the next venue for World Youth Day celebrations will be Krakòw, Poland. Pope Francis made the announcement in Rio de Janeiro Sunday, the final day of his week-long pastoral visit to Brazil for WYD 2013. The decision to hold World Youth Day in Poland’s second largest city will come as no surprise to many. Blessed Pope John Paul II, a Pole who led the Archdiocese of Krakòw for some 15 years and the Universal Church for nearly 27, is soon to be canonized, becoming one of the country’s newest saints. Not long before departing for WYD in Brazil, on July 4, 2013, Pope Francis confirmed his approval of Karol Wojtyla’s canonization, in a process initiated in 2005 under the pontificate of Benedict XVI. The Polish pontiff will be canonized together with Pope John XXIII in a special mass expected to take place before the end of 2013. Hundreds of thousands of Poles came to Rome to mourn their beloved pope in April 2005 after John Paul II’s death. They credit him with the downfall of the former communist regime and the resurgence of Poland’s Catholic identity. (Vatican Radio) The Metropolitan Archbishop of Krakow, Cardinal Stanislaw Dziwisz has welcomed Pope Francis’ decision to hold the next World Youth Day celebrations in his city in 2016. In a statement from Rio de Janeiro where Blessed Pope John Paul II’s former secretary is currently attending this year’s WYD celebrations, Cardinal Dziwisz says he and the whole Church in Poland "rejoice” in the Holy Father’s acceptance of their invitation especially because 2016 will mark the 1050th anniversary of the Baptism of Poland. He also attributes to John Paul II the institution of World Youth Days. It is with great joy that I received the message announced today by Pope Francis that the next World Youth Day will take place in Poland in the year 2016. It is a joy, an honour and a great responsability for us. In that year we will also celebrate the 1050th anniversary of the Baptism of Poland. And now praise His name, I am free. (Vatican Radio) Pope Francis met with the leadership of the Council of Bishops’ Conferences of Latin America and the Caribbean, CELAM, which is holding its general coordinating meeting this week. The meeting was one of two appointments expressly desired by the Holy Father outside the context of World Youth Day, during his week-long visit to Rio for the World Youth Day celebrations. The first was a visit to the Marian shrine at Aparecida. It was in Aparecida in 2007 that the CELAM bishops held their 5th General Conference, which produced a major three-part document outlining a plan for assessment of the situation of the Church in Latin America and implementing pastoral strategies to renew and revitalize the faith in the region. In his remarks to the CELAM leadership, Pope Francis said that the desired renewal is already underway in many particular Churches. His prepared address focused on the legacy of CELAM 5. (Vatican Radio) In one of his final engagements in Rio de Janeiro, Pope Francis met Sunday with hundreds of volunteers who had helped make World Youth Day 2013 a tremendous success. (Vatican Radio) Pope Francis on Sunday evening delivered his goodbye speech to all those present at Rio de Janeiro’s Galeao Airport gathered to see him on his way and to say “farewell”. Brazilian President Dilma Roussef headed the delegation of political and civil authorities together with a numerous contingent of Cardinals and Bishops of the nation. In his address, Pope Francis thanked the President, his brother Bishops and their collaborators, and the entire population of Brazil for making this week “a splendid celebration of the richness and joy of our faith in Jesus Christ”. And he expressed his gratitude for the work of event organizers and media operators. And in particular he said his “gratitude goes to the many people who prayed, often in silence and simplicity for this World Youth Day to be an authentic experience of growth in faith”. But above all – Pope Francis said – “my thoughts turn to those who are at the heart of these celebrations: the young people!” . “Many of you came here as disciples” – he continued – “I have no doubt that all of you will leave as missionaries”. And he urged them to help build a civilization of love: “Show, by your life, that it is worth giving your time and talents in order to attain high ideals, it is worth recognizing the dignity of each human person, and it is worth taking risks for Christ and the Gospel”. “I will always place my hopes in the young people of Brazil” – Pope Francis said – “and in the young around the world: through them, Christ is preparing a new springtime all over the earth”. The Pope concluded his farewell speech turning his thoughts to Our Lady of Aparecida and imploring Mary to strengthen all Brazilians in the Christian faith. (Vatican Radio) L’Autorità Informazione Finanziaria (AIF), the Financial Intelligence Unit of the Holy See and Vatican City State, signed a Memorandum of Understanding with its Italian counterpart, the Unità di Informazione Finanziaria (UIF) of the Bank of Italy, on July 26. The Memorandum was signed in Rome by Cardinal Attilio Nicora, President of AIF, and Dr. Claudio Clemente, director of UIF. A Memorandum of Understanding is standard practice and formalizes the cooperation and exchange of financial information to fight money laundering and terrorist financing across borders between the competent authorities of both countries. It is based on the model Memorandum of Understanding prepared by the Egmont Group, the global organization of national Financial Intelligence Units, and contains clauses on reciprocity, permitted uses of information and confidentiality. (Vatican Radio) Pope Francis landed at Rome’s Ciampino airport this morning, marking his return from World Youth Day 2013. The 12-hour flight from Rio de Janeiro marks the end of Pope Francis’ first overseas Apostolic Voyage. The weeklong youth event ended Sunday with Mass on Rio’s famous Copacabana beach, an liturgy attended by approximately three million people. After his arrival at Ciampino airport, the Holy Father chose to stop at the Basilica of Saint Mary Major to offer a brief prayer to the Blessed Virgin for World Youth Day. Published: Monday, July 29, 2013, 9:03 a.m.
Pope Francis answers reporters' questions during a news conference aboard the papal flight on its way back from Brazil on Monday. ABOARD THE PAPAL AIRCRAFT -- Pope Francis reached out to gays, saying he won't judge priests for their sexual orientation in a remarkably open and wide-ranging news conference Monday as he returned from his first foreign trip. "If someone is gay and he searches for the Lord and has good will, who am I to judge?" Francis asked. "We shouldn't marginalize people for this. They must be integrated into society." Francis' predecessor, Pope Benedict XVI, signed a document in 2005 that said men who had deep-rooted homosexual tendencies should not be priests. Francis was much more conciliatory in his first news conference as pope, saying gay clergymen should be forgiven and their sins forgotten. The comments did not signal any change in church policy. Catholic teaching still holds that homosexual acts are "intrinsically disordered." But they indicated a shift in tone under Francis' young papacy and an emphasis on a church that is more inclusive and merciful rather than critical and disciplinary. Francis also said he wanted a greater role for women in the church, though he insisted that they cannot become priests. He was funny and candid during the 82 minutes he spent with journalists on board the plane returning from Brazil. He didn't dodge a single question, and even thanked the journalist who raised allegations contained in an Italian news magazine that one of his trusted monsignors was involved in a gay tryst. Francis said he investigated the allegations according to canon law and found nothing to back them up. Pope Francis reiterated the Roman Catholic Church's ban on women priests, saying the decision is "definitive" although he would lik women to have more leadership roles in administrative and pastoral activities. Speaking to reporters Sunday night while flying home from a week-long visit to Brazil, Pope Francis said "the Church has spoken and says no â?¦ that door is closed." It was the first time Francis - elected the first non-European pope in 1,300 years - had spoken publicly on women in the priesthood. He said women have a special mission in the Church as "first witnesses" of Christ's resurrection. The Roman Catholic Church's all-male priesthood has been under attack for years, particular;y as Protestant denominations have begun ordaining women. Pope Francis said he finds nothing objectionable about homosexual impulses and urged gay members of the clergy to follow their mission and eschew lobbying within the Church.